Photo Caption A: Michael J. Smith, President of Berkeley College (far left), joins Berkeley College staff and students at the Food Bank for Westchester on May 23, 2017, as part of the College’s Community Service Week. Click here to watch FiOS1 News’ story about this. 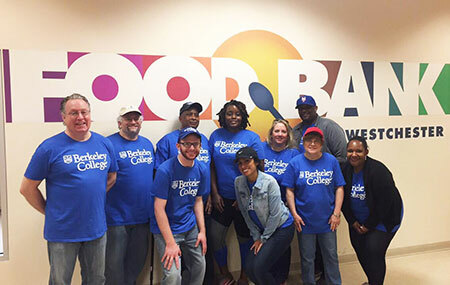 In 2017, Berkeley College extended its signature annual volunteerism event for Community Service Week, with Berkeley College faculty, staff, alumni and students contributing hours of service at more than 43 nonprofit sites in New Jersey and New York throughout the week of May 21 to May 26, 2017. The initiative builds on Community Service Day, which began in 2010. FiOS1 News spoke with President Smith while he volunteered with Berkeley College staff and students at the Food Bank for Westchester on May 23, 2017. Click here to watch the news segment. Community Service Week began on Sunday, May 21, 2016. Berkeley College in Woodland Park, NJ, hosted the 2017 Walk to Cure Arthritis New Jersey. Additional walks that day included the AIDS Walk in Central Park, NY, and Great Strides for Cystic Fibrosis in Paramus, NJ. 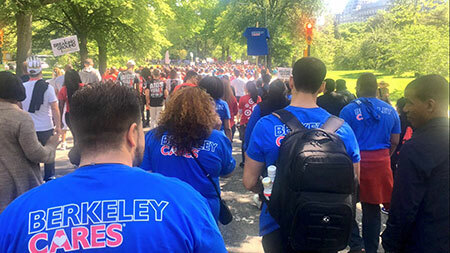 Photo Caption B: Berkeley College faculty, staff, alumni and students participate in the AIDS Walk in Central Park, NY, on May 21, 2017, kicking off Community Service Week at Berkeley College. Locations included nonprofit organizations in Bergen, Essex, Middlesex, Monmouth, Morris, Passaic and Sussex counties in New Jersey, and in the Bronx, Brooklyn, Manhattan, Queens, and Rockland and Westchester counties in New York. Photo Caption C: (Left) Berkeley College volunteers apply mulch and plant flowers at the entrance of the Bergen County Zoo at Van Saun Park in Paramus, NJ, on May 23, 2017, as part of Community Service Week. (Right) Angela Alexander, Academic Advisor, Academic Advisement, Berkeley College, plants flowers for Family Promise of Morris County in Morristown, NJ, on May 24, 2017. Family Promise of Morris County offers emergency shelter and supportive housing to families in need. Berkeley College has five New Jersey campuses – Dover, Newark, Paramus, Woodbridge and Woodland Park. In New York there are three campuses – Midtown Manhattan, Brooklyn and White Plains. Berkeley College Online® serves a global population. For four consecutive years, U.S. News & World Report has named Berkeley College among the Best Colleges for Online Bachelor’s Programs and among the Best Online Bachelor’s Programs for Veterans. The website address iswww.BerkeleyCollege.edu.